Accompanying the wide-angle 48MP shooter is a 16MP sensor paired with an f/2.2 lens, which will allow you to capture ultra-wide shots. There’s also a 2MP f/2.4 camera that’s meant to enable the depth effect. Switching between these three modes is a breeze thanks to the phone’s well-equipped Camera app, which has also been blessed with several AI-based features like scene recognition and more. This is what all the hole punching has been done for. The front camera of the Nova 4, which sits inside the display, is a 25MP unit with an f/2.0 lens. This will allow you to capture well-detailed selfies, while taking advantage of a beauty mode and other AI-based offerings. Like the rear camera, the selfie camera too grabs gyro-EIS that stabilises any video footage that’s captured by it. Speaking about videos, it can shoot 1080p clips at 30fps. It’s not at all surprising that Huawei has used its proprietary Kirin 970 chipset in this phone. The SoC comprises a 2.4GHz octa-core processor and a Mali-G72 MP12 GPU. This assembly is accompanied by 8GB of RAM. The combination should ensure that heavy apps and games run smoothly. And if you’re concerned about storage, do take note that 128GB of space comes as standard on the Huawei Nova 4. Additionally, you can top it up to 512GB of expandable storage with the use of a microSD card. 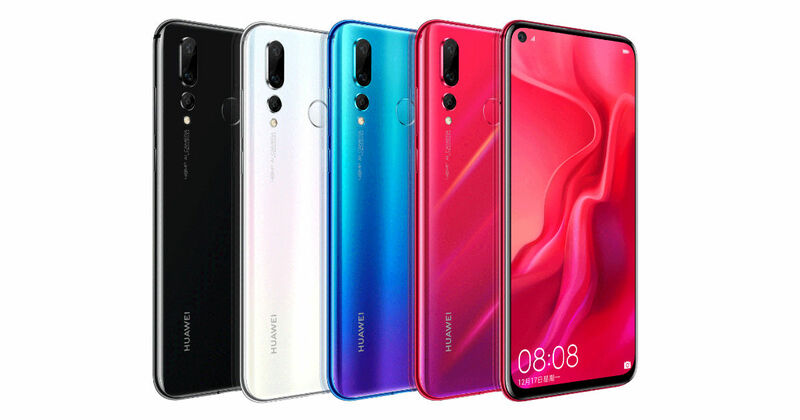 Without a doubt, the new Huawei Nova 4 is an excellent phone with a design that may very well become a trend going into the next year. And we can’t wait to test it out once it lands in India, though it remains to be seen if dit does come to our shores.